Wilson gained a lot of press a few years ago threatening to commit suicide during a break-up with Kate Hudson. Wilson, 42, starred in Little Fockers released over holidays 2010. 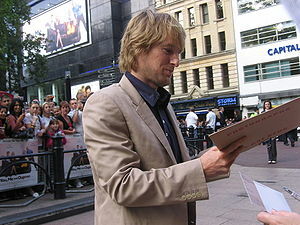 He stars in the upcoming “Hall Pass” set to hit theaters February 25, 2011. In “Hall Pass” Wilson plays a man given a “pass” to have extramarital affairs. I’m not so sure this a good role model for new dads to even fantasize about emulating.